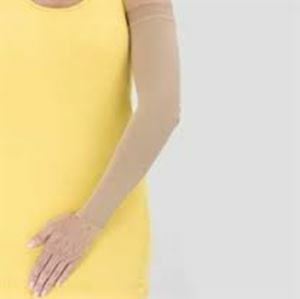 Natural Rubber Armsleeve by Sigvaris is designed to prevent the fluid from getting accmulated in the arms. Manufactured with the combination of natural rubber and nylon. Perfect for post arm surgeries and for burn treatment. Covered with a 2-layered yarn that helps easy put-on and pull-off. The sleeve comes in Beige color. Available in three sizes; Small, Medium, Large. Comes in two lengths; Short and Long.